This spectacular space wallpaper from the Wide Field Imager on the MPG/ESO 2.2-metre telescope at the La Silla Observatory in Chile shows the globular star cluster NGC 6752 in the southern constellation of Pavo (The Peacock). This spectacular space wallpaper from the Wide Field Imager on the MPG/ESO 2.2-metre telescope at the La Silla Observatory in Chile shows the globular star cluster NGC 6752 in the southern constellation of Pavo (The Peacock). 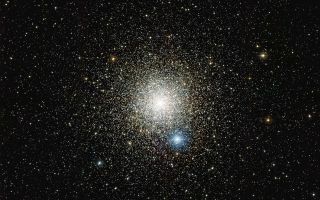 Studies of this cluster using ESO’s Very Large Telescope have unexpectedly revealed that many of the stars do not undergo mass-loss at the end of their lives. This image was released May 29, 2013.